Playing blues on the piano is not at all hard – actually, it’s pretty easy once you learn the basics. Nowadays, the blues is generally associated with the guitar, and for a reason. However, in the early years, once the blues moved from the cotton fields into larger towns and cities, things changed. In the early twentieth century, the jazz musicians adopted the patterns of blues songs into their own playing. What until then had been played solely on the guitar (and the harmonica), started being played on the piano. Jazz subgenres, such as boogie-woogie and ragtime, actually rely heavily on the blues structure. So, if you wonder how to play blues piano, know that it’s quite easy. Let’s start from the essentials. 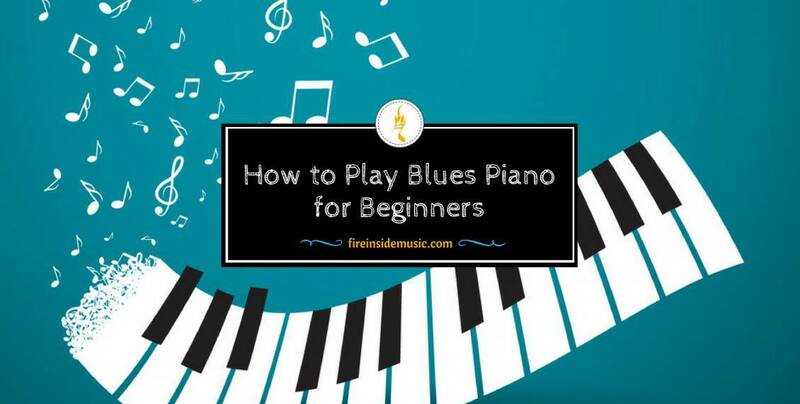 This is very important if you really want to learn to play blues on the piano. It cannot be emphasized enough – you simply have to develop the ability to play well with both hands. Mind you, it doesn’t have to be too advanced – but you should be able to use the accompanying hand “fluently”. A vast majority of blues songs is very slow, so this is not a question of gaining speed. It is more like developing the ability to synchronize your left with your right hand. This is especially important for the blues because, unlike some other musical genres, it also involves singing. When you’re playing jazz or even classical music, you are focused solely on your playing. There are jazz compositions for singing as well, but there is also a lot of instrumental music out there. The same thing goes for classical music – you only play it, without using your voice. But when it comes to the blues, you have to count in the voice as well. The reason for this is that the blues was primarily a vocal type of music early on, and it incorporated musical accompaniment much later. This fact makes the whole process of playing the blues on the piano slightly more difficult. However, it is only so in the beginning. Because, deep down, blues is very simple and it can be learnt in a matter of days, perhaps even hours if you’re willing enough. Mastering it is a whole different issue, but learning the basics is pretty straightforward, so you shouldn’t worry about it at all. Anyway, without good hands coordination, you will be stuck and won’t make any significant progress. The melodic lines you play don’t have to be rich or intricate – you only need to play simple chords. The backing (bass) lines you play also don’t have to be complicated at all, but they need to provide solid beats to the song. 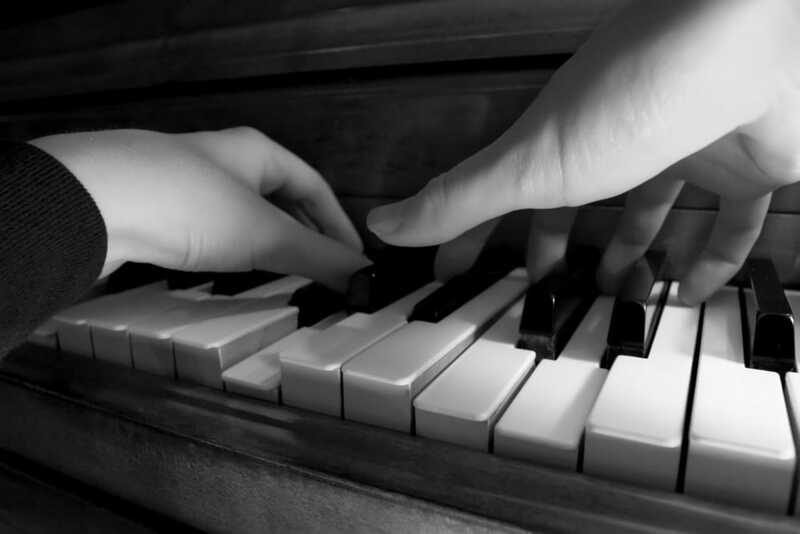 So, in order to play blues on the piano – be sure to have great hand coordination. There are plenty of exercises for this online, so be sure to check them out before starting to play. A good idea is to practice every day, or at least three times a week. In due time, you’ll develop good hand coordination, thus being able to move on and actually start playing. Now that you’ve mastered this important step, you’re able to go to the next one. The blues is very good for playing because it lends itself to the player due to its simplicity. Let’s see what the simplest playing pattern for the blues is. Basically, the blues pattern is quite simple and easy to play. This is one of the reasons why blues has become one of the most popular music genres of all time. You can learn this pattern very quickly, and use it and reuse time and again. The blues pattern comes down to the so-called 12-bar structure. The name 12-bar refers to the twelve measures of music that form the basis of a blues song. In the most basic form, it is only three chords that are used here. It can be both major and minor chords, but the use of major chords in the 12-bar pattern is definitely more frequent. Which chords are used in the 12-bar pattern? It is always the first, fourth and the fifth chord of a key. For example, if we play in the key of A, the accompanying chords of A-major would be D-major and E-major. D-major is the subdominant, and the E-major is the dominant. Then move to the D=Major. Because the E-major is the dominant chord, it “leads” into the starting point, which is the A-major. Then move to the G=Major (subdominant). It is not necessary to know the scales in order to play the 12-bar structure, but it can definitely be of help. You can learn how to play it only by memorizing the chord groups, and use them when playing a specific key. Since the 12-bar pattern is the simplest form of the blues, you can start off by playing it on the piano. You won’t have many chord changes, and you can adjust the tempo to your own level of playing. All the early blues songs were very slow, and this might come in handy if you’re just starting out, or you need a bit of practice. It’s almost the same with the minor chords. The same 12-bar structure can be played with the same three chords in the exact same order, be it major or minor chords. Obviously, the major chords will give you a lighter tone and the minor ones a more sad, brooding atmosphere to the song you’re playing. four bars of the primary chord. Let’s see how this looks like with the actual chords. We will use the key of A-major, and one letter will represent one bar (four beats, to make it easier for you to count). In order not to lose track of the bar you’re in, all you have to do is start counting, slowly but steadily. One bar = four beats. 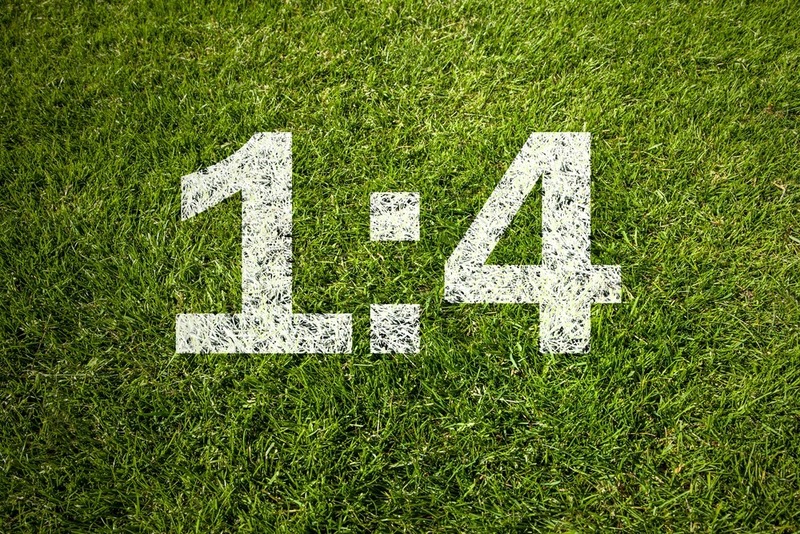 This means that you should be able to count from one to four for the duration of one bar, and not move into another bar before you’re finished counting. This is very easy, because in the 12-bar pattern you don’t have chords that share one bar – everything is clear and straightforward. When you have two or three chords in one bar, it’s harder to count the beats and change the chords at the same time. But here - there’s no such thing. The three-chord pattern is the easiest way to start learning to play blues on the piano, so definitely start here. one bar of the primary chord. To see how this looks like in practice, we’ll use the A-minor key. For the sake of difference, we’ll mark the minor chords with small letters, as it’s often done. Again, you will count every bar with four steady beats, without a hurry. If you’re having a hard time, slow down as much as you need, and don’t speed up until you’re confident enough. Once you’ve mastered the 12-bar pattern, you can move on and start adding chords and scales to your blues piano playing. Mind you, you don’t have to do this – it’s up to you! The blues is so good for playing because of the fact that it doesn’t require a lot from a player. You can be a solid blues piano player if you only know the 12-bar pattern and nothing else. By knowing the 12-bar, both major and minor, you’ll be able to play dozens of songs. Furthermore, you’ll also be able to compose some songs of your own because of the 12-bar pattern. It is the basis of all blues, so it might come in handy if you decide to try your hand at composing. However, if you want to play something more complicated, then you will have to branch out a little. Over time, playing the same thing over and over again might become tedious and boring. The 12-bar pattern is great and all, but it won’t hurt to spice things up a little bit and upgrade your playing. By only repeating the chords, you’ll run around in circles. This is why it’s great to incorporate the blues scale into your playing. By doing this, you will know how to play melodic pieces and also how to improvise in between the chords. 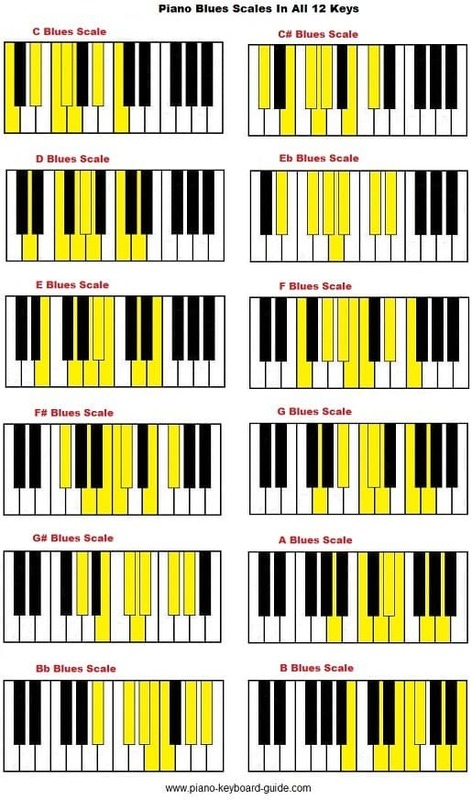 One of the easiest and most important scales for blues piano is the so-called blues scale. Basically, it is a minor pentatonic scale. The only difference is that we add a blue note to it. The blue note is the name for the note that adds a little bit of melody to the pentatonic scale, making it more suitable for instrumental playing. 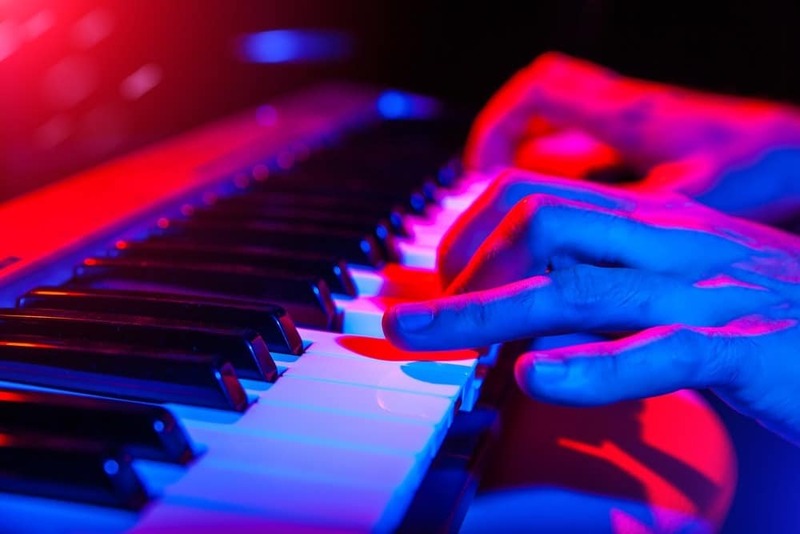 To give you a practical example of the blues scale, let’s see what it is in the key of C.
These are the notes: C, Eb, F, Gb, G, Bb, and C.
There are more scales suitable for playing blues on the piano, but you won’t need them for now. Not only that – if you want to keep things simple, you won’t need any other scale at all! By having a good combination of the 12-bar pattern and the blues scale, you’ll be able to play quite well. However, it’s always beneficial to add new chords to your catalog. Why are new chords so beneficial? 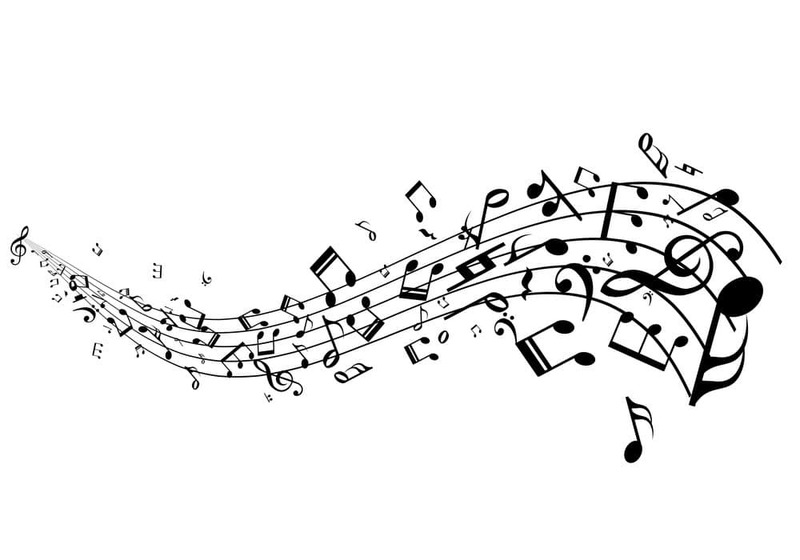 Because music is based on harmony, and each music genre has its own set of harmonies and harmonic “solutions”. By broadening your scope of chords, you will make your playing richer, and the sound will be more “interesting” to the ears. One of the most common groups of chords to add to your playing is the sixth chord, or simply – the sixth. It is called like this because of its formation – you form a sixth chord by adding the sixth note of a specific scale to the basic chord. Those basic chords, to which you add the sixth note, are also called the triads – because they need three notes to take shape. Triads can be both major and minor, and you can add the sixth note to both groups. On top of this, there are more “funny “ chords to spice up your blues piano playing, but there is no need to rush things. Chords such as dominant sevenths and ninths are great, but they might be a bit overwhelming at this point. Take your time and be sure to master the basic – after that, additional material will come easier and you’ll make progress faster. This is a topic a lot of novice players are not sure about. Of course, a lot of those learning blues piano are learning it on the electronic keyboard, but it’s not all of them. Some of them prefer playing on a proper piano, so they have their own doubts. Should you use the sustain pedal for playing the blues on the piano? Moreover – is it necessary to use the sustain pedal while playing blues piano? Well, if we first think about what the sustain pedal is used for – we’ll see that its main function is to extend the duration of a played note. Is it used in blues playing? Yes, you can definitely use it if you want. There is no rule against it, but it’s not necessary like in classical music. Many classical pieces wouldn’t sound right if there wasn’t for the sustain pedal to keep the notes ringing on. When it comes to blues piano, there are two basic ways of playing. You can play separate, choppy notes, or you can make them join, flowing one into another. This depends on many things: your personal preference (style of playing), the actual musical piece, etc. So, if you want to connect the notes into a “string” of unbroken sound, be sure to use the pedal. If you want to keep the notes separate from each other, there’s no need for the sustain pedal. Overall, using or not using the sustain pedal won’t affect blues piano playing to a large extent. By the way, you are allowed to experiment as much as you like, and search for your own ways of expression. 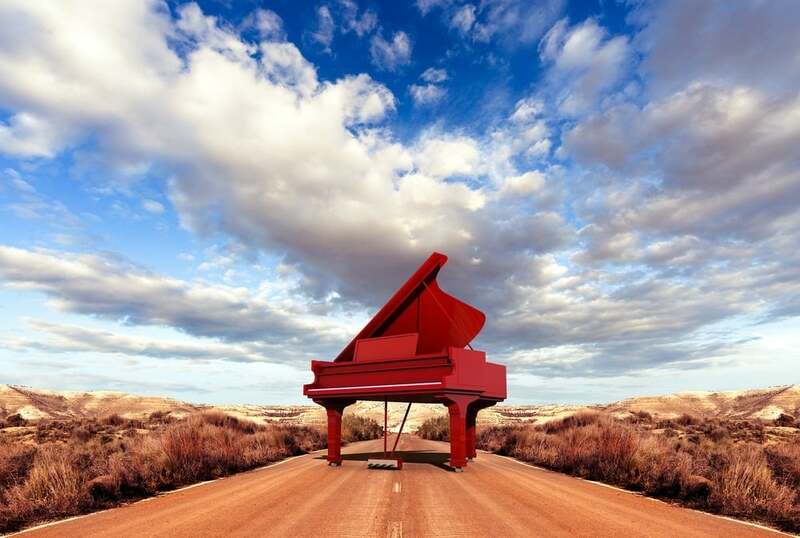 If you don’t want to learn blues piano on your own, but you don’t know where to start – you can choose between taking lessons or watching tutorials. 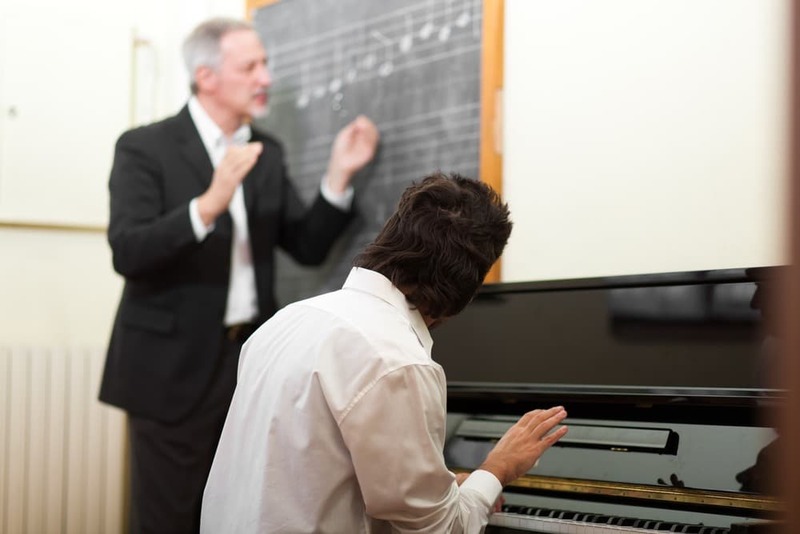 The problem with private lessons is that they might be too expensive for you, especially if you’ll take a lot of them. Having a tutor helping you out is usually a good thing, but perhaps you should avoid it at first. Also, be wary of watching too many online tutorials. Yes, there’s a lot to pick from, and you could literally watch for hours on end, but it doesn’t mean it will be beneficial. If you’re just starting out, focus on yourself and your own “feel” of the instrument. Don’t oversaturate your brain with heavy content. First, you should be comfortable playing simple structures, such as the 12-bar pattern. Then, you can add a couple of new chords. You can watch tutorials covering the things you’re currently learning, but avoid watching complicated lessons you’re still far away from. Once you’re comfortable playing the basics, you can delve deeper and explore all the intricacies of blues piano. Playing blues isn’t hard at all – all you need is enough willpower to master the essentials. Compared to jazz or classical music, it’s really a breeze. Plus, it’s so much fun to play blues piano, because you can sing as well, and have a full musical experience. Just be sure to cover all the basics, and you’ll have no problems along the way.